When it comes to eating healthy, I’m not always known for my self-discipline. Sure, I had a month this summer where I stayed away from all carbs, breads, and otherwise joy-inducing foods, but generally, I’m in a constant state of declaring healthy intentions while simultaneously shoving Kit-Kats into my face. This past week was no exception. Things started off in a dark (read: wonderful place) when a visit to the Orange County Fair resulted in sublime consumption of funnel cake, chocolate dipped ice cream cones, and various other diet-adverse items. I swore I would do better for myself, but of course, things rapidly spiraled out of control. 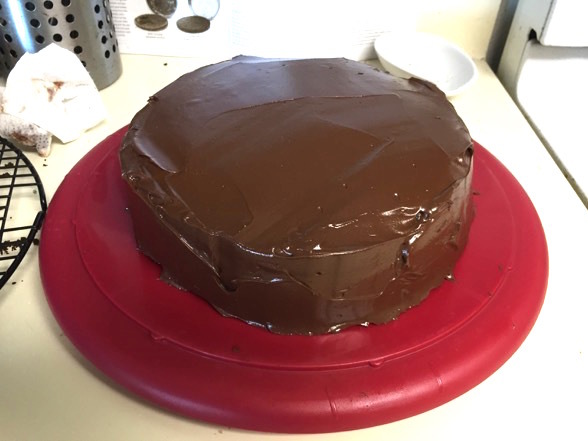 You see, the latest issue of Cook’s Illustrated appeared in my mailbox, and in its monochromatic pages was a recipe for Chocolate-Caramel Layer Cake. Suddenly, hearts appeared in my eyes and Tchaikovsky’s love theme from Romeo & Juliet blared all around me. I had to make this. I had to! But I couldn’t, especially not during this week of county fair gut reparations. Besides, why would I just make a CAKE for no reason? And then fate came calling. Turns out I had plans to attend a game night at the end of the week, and as luck would have it, that game night was now being upgraded to a birthday celebration for my friend Lodric. I was told I was on cake duty, and far be it for me to deny that responsibility. The planets had aligned: I had the perfect excuse to make the chocolate-caramel layer cake. Every so often, I post some amazing cake that my friend Mark Randazzo has whipped up at his bakery, Mark Joseph Cakes. Well, this latest offering for a Trump Soho bridal shower is one of his most impressive, at least in terms of recreations. 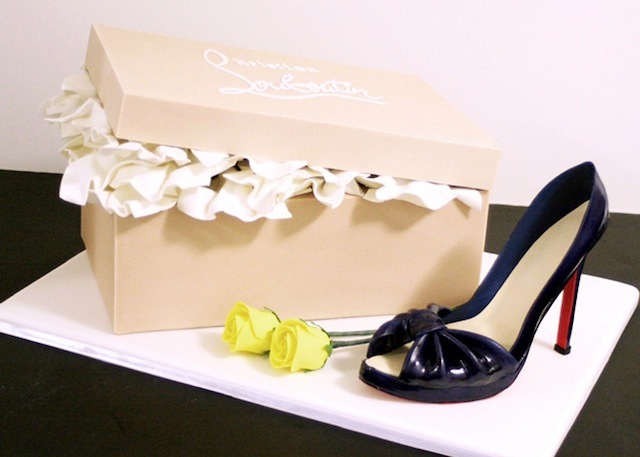 It’s a cake in the form of a Christian Louboutin shoebox with a red-soled sugar shoe on the side. Color me impressed. I fully expect this to take Pinterest by storm. 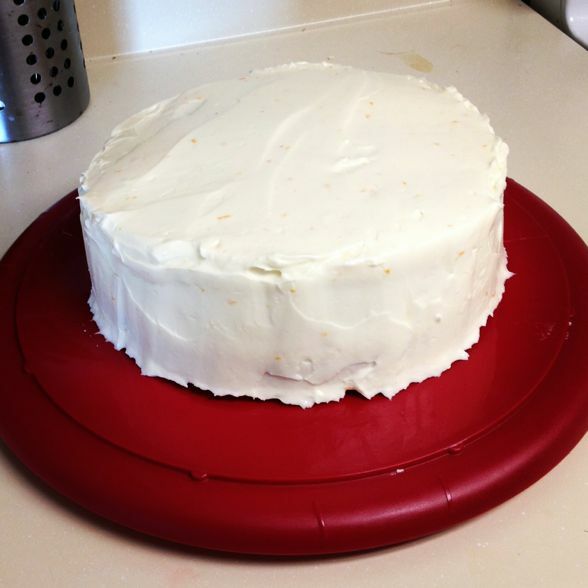 ADVENTURES IN DOMESTICITY: Entenmann’s Cake Challenge Results! 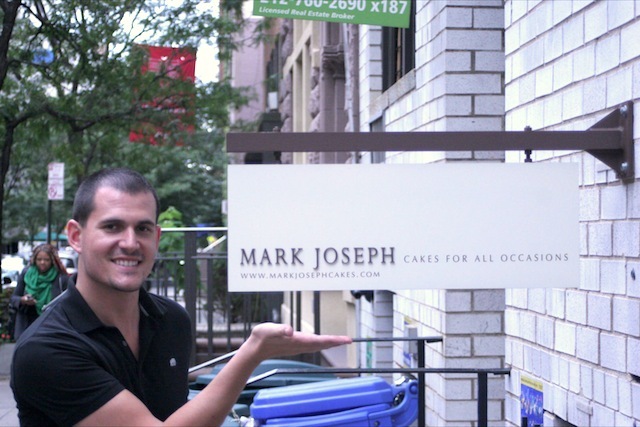 Every so often I post about my friends’ bakery, Mark Joseph Cakes, which is run by Mark Randazzo and his wife Leslie. Mark is responsible for my most popular blog post of all time (the famed R2-D2 cake, which still draws hundreds of readers every day), and I’m happy to report that since that droid cake first appeared on this blog three and a half years ago (!! ), Mark and Leslie have been up to great things. Not only do they still crank out awesome cakes, but they now consistently land on the pages of various bridal magazines such as The Knot and most recently, they were profiled in New York with a full page spread. Last week, I was both craving chocolate and feeling the need to procrastinate on an epic scale. What better excuse to bake a chocolate cake? But which recipe should I use? 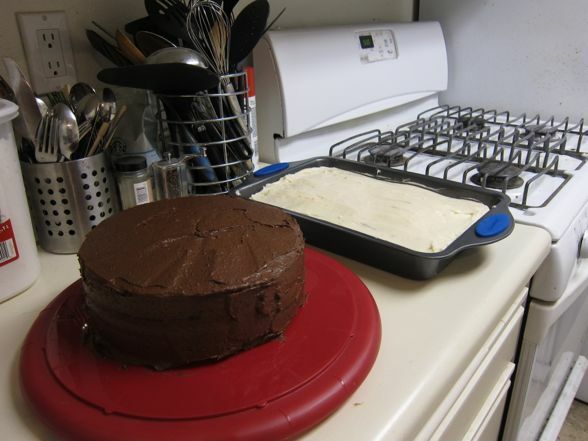 The last time I tried to make chocolate cake, I made an epic disaster by fusing a Mark Bittman recipe with an Aida Mollenkamp pudding frosting. It was all sorts of wrong (although the pudding frosting was quite delicious). Nevertheless, when it comes to these sort of First World problems, I always head to my favorite TV cook: Ina Garten! One of Ina’s top recipes is her famous “Beatty’s Chocolate Cake,” which currently has a five-star rating on Foodnetwork.com with 1,250 reviews. Yes, this is probably Ina’s most popular offering, but I’ve never attempted it before because quite frankly I was scared. 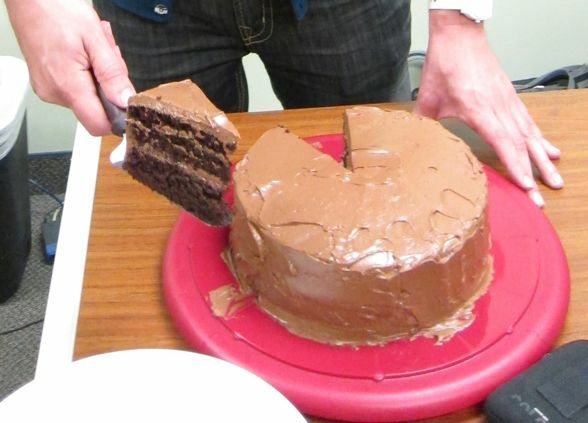 You see, about two years ago, my friend jash attempted Beatty’s Chocolate Cake, and the result was a smoky, messy cake wreck. The batter overflowed in his pans, spilling out all over the oven and wreaking general havoc on his kitchen. This was notable because a) Ina recipes rarely go this wrong, and b) jash is a very accomplished home cook in his own right. He NEVER encounters such catastrophe. Surely if jash couldn’t succeed, what chance did I have? I mean, earlier this summer I left the FLOUR out of a cookie recipe. I made cookies with NO FLOUR. I shouldn’t even say that I made cookies. I made a crumbly MESS. Beatty’s Chocolate Cake would certainly be a risky endeavor. Once again, CSN Stores gave me a gift certificate for me to use in return for some reviews of whatever I purchase with it. 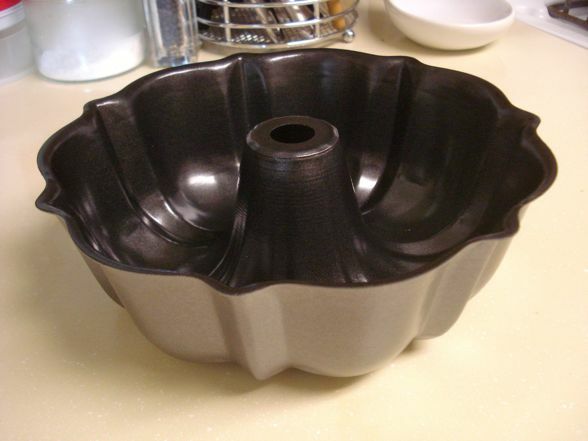 For my latest batch of housewares, I ordered a Bundt pan because, well, why not? I wouldn’t say that I’m an avid Bundt maker, but it’s nice having the pan, and the thought of replicating those amazing Costco chocolate ring cakes in my very own kitchen was a bit too intoxicating to pass up. And so I happily added a nifty Bundt pan to my cart, and a few scant days later, it arrived on my doorstep (ironically the very same day that local bakery Kiss My Bundt went out of business. The circle of Bundt life continues).